A new era in cancer treatment in Georgia begins today as Emory Healthcare and Winship Cancer Institute join state and local government officials to break ground on the first facility in Georgia to offer the most advanced radiation therapy possible – proton beam therapy. 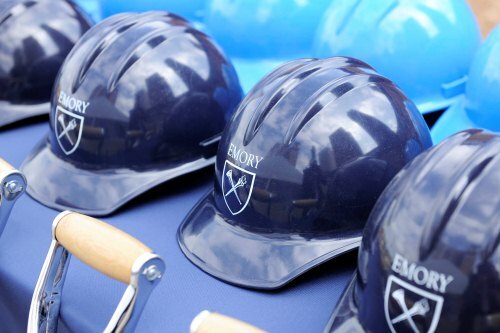 Atlanta Mayor Kasim Reed, Emory President James Wagner and other officials will wield the shovels today at 4 p.m. at the corner of Peachtree Street and North Avenue, the site of the new 107,000 square-foot facility. The Emory Proton Therapy Center, just a few blocks from Emory University Hospital Midtown, is expected to treat approximately 2,200 cancer patients a year and open its doors in 2016. The proton facility is being built in partnership with Advanced Particle Therapy, LLC of San Diego, CA. The center bolsters the position of Winship Cancer Institute, Georgia’s only National Cancer Institute designated cancer treatment facility, as the state’s leader in cancer treatment. Children with cancer particularly stand to gain from proton beam therapy, Curran explained, because the fast-growing cells of children are especially vulnerable to traditional radiation. “APT is honored to team with Emory and its nationally recognized radiation oncology faculty to bring this proton therapy center to the Atlanta region,” says Jeff Bordok, president and CEO of Advanced Particle Therapy. Proton therapy allows for a highly targeted dose of lifesaving radiation therapy to be delivered directly to the tumor while minimizing the exposure to healthy issue. This can result in a more effective treatment for patients with fewer side effects. This advanced technology is approved by the U.S. Food and Drug Administration and reimbursed by both Medicare and private insurance. Around since the 1950s, proton therapy has been used to treat more than 110,000 people worldwide. Patients typically receive approximately 30 treatments during a four- to six-week period. Each treatment lasts for approximately 15-25 minutes, after which the patient is free to carry on with daily affairs. Proton therapy involves the use of a focused beam of protons to target tumors with control and precision unavailable in other radiation therapies. The precise delivery of proton energy limits damage to healthy surrounding tissue, resulting in minimal or no side effects to the patient. This precision also allows for a more potent and effective dose of radiation to be used. Children are a prime example of who benefits most from limiting radiation, as they are particularly at-risk for the traditional side effects commonly expected from conventional radiation. Proton therapy and standard x-ray therapy (photon radiation) both target specific, cancerous cells in the body. The major advantage of proton treatment is that clinicians can better control the energy distribution of protons as they are deposited in tissue. The Varian Probeam superconducting cyclotron featured at the Emory Proton Therapy Center is a 90 ton machine that accelerates protons to two-thirds the speed of light. This cutting-edge system also features pencil-beam (or spot) scanning, which allows for modulation of the proton beam’s intensity. This enables doctors to precisely shape the dose distribution to concentrate on the targeted tumor, while sparing normal healthy tissue. The calculated dose is “painted” to the tumor from multiple angles, with the beam intensity modulated and shaped to match the shape of the tumor. The treatment is delivered through the gantry which is three-stories tall and has the ability to rotate 360 degrees around the patient.